ENTER CODE ‘ELIZAANDETHAN20’ AT THE CHECKOUT FOR 20% OFF! – Wear over 25 different ways! – No alterations necessary – ideal for bridesmaids! Click here to book an appointment for our showroom: showroom@alila.ie. 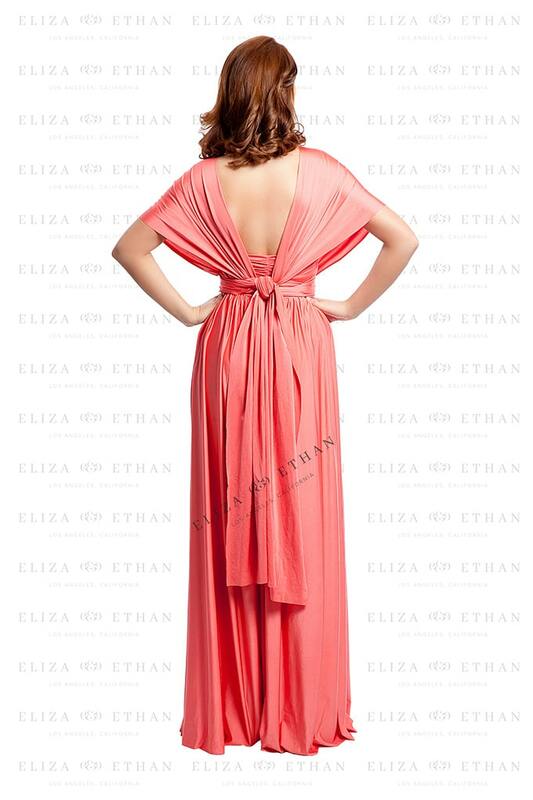 The Eliza & Ethan Coral Multi-wrap dress is one dress that can be worn over 25 different ways. Perfect for every occasion; debs, weddings, bridesmaids, black tie events, etc. It is the ultimate bridesmaids dress as it is available for immediate delivery, no alterations necessary, maternity friendly and each bridesmaid can wear it a different way. Wear with or without bandeau, it’s entirely up to you! With bandeau means you can wear a bra no problem. Wear one shoulder style, 2 straps – twisted or wide, cap sleeves, back open or covered, grecian style, halter neck, the ways to wear are endless! Add brooches or corsages to accessorise and change it up. Matching flower girl sashes also available to order in all colours. We are delighted to announce the opening of our new appointment only showroom! Perfect for you and your bridal party to come and view our amazing Eliza & Ethan multiwrap range, the ideal bridesmaid dress! Our gorgeous new bright and spacious showroom is fitted out with floor to ceiling mirrors so you and your bridesmaids can view our Eliza & Ethan dresses from every angle! We have all 26 colours in stock so we can guarantee to have a colour to suit your big day. You will also have an Eliza & Ethan multiwrap dress specialist on hand to demonstrate all the beautiful different ways to style these much sought after bridesmaid dresses! To book an appointment please email showroom@alila.ie! * Free and immediate delivery to Ireland and the UK. Shipping costs apply to other countries. One size fits UK 6-18 & the matching bandeau is available to order in XL separately (ideal for larger busts). How to Tie the Multiwrap Dress? We have recorded videos below showing you how to tie the Eliza & Ethan Multiwrap dress. Simply click play, and select the style you would like to achieve from the playlist drop-down.